Vis is the most isolated inhabited island of the Middle Dalmatia; it is approximately 50 km away from the mainland. That kind of isolation made Vis a very special place, many will say, a place tailored to men. The simplicity of life reflects in every sphere of the island’s reality, unspoiled by the tourist commercialization. You will be greeted with genuine, sincere hospitality upon your arrival and have the chance to enjoy the true beauty of the island’s everyday life, nature and people in all its simple loveliness. Vis has been blessed with unseen natural beauties, practically perfect climate and the richness of natural resources. Its well-indented coast offers a variety of amazing beaches, surrounded by the impeccably clear open sea. Some of the beaches are incorporated in the existing settlements, and some are reachable only by boat. There is a number of sand-covered beaches perfect for children, beautiful pebbly beaches protected by the natural shade of the pine trees and rocky coves shielded by the steep cliffs; the choices are practically endless. Numerous sources of fresh drinking water are ensuring the continuing development of the island’s agriculture. Fertile fields are scattered all across the inland area; rich vineyards overlooking the olive plantations. There practically isn't a fruit or vegetable that can’t be grown on the island of Vis. Vis is among the richest fishing areas on the Adriatic Sea. The local fish markets are proud of their daily offer of fresh fish and seafood, known to be the best in Dalmatia. The only way to reach Vis is by boat. Regular ferry and catamaran lines sail to and from Split several times a day. Once you arrive the accommodation options are numerous. 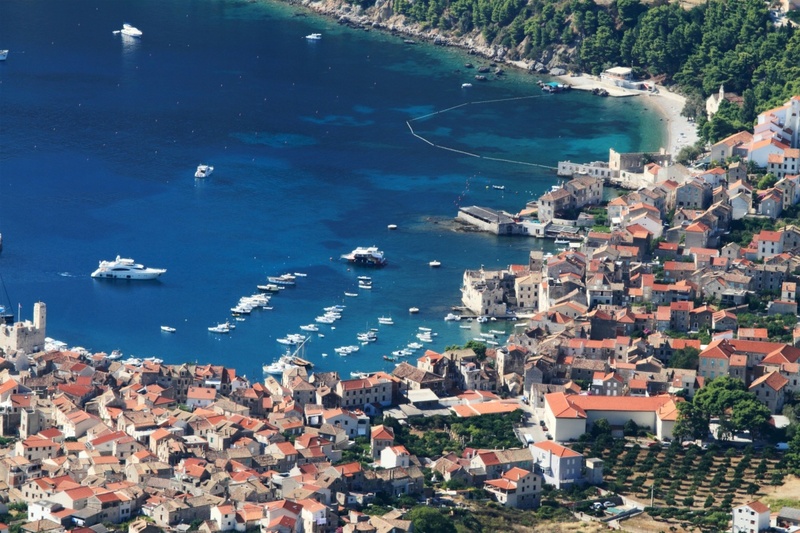 If you prefer to stay in one of the island’s bigger settlements, you can seek hotel accommodation in Vis or Komiza. There are four hotels; one of them, San Giorgio in Vis, is a four star resort. And if you prefer to try the coziness of the private accommodation, there is a wide range of private apartments across the entire island. It has been said that Vis is the place where you can try the best food and the best wines in this part of the Adriatic. Numerous restaurants, taverns and family households will be tempting you with the irresistible aromas of the fresh, beautifully prepared dishes. A rich selection of fish and meat specialties is inevitably accompanied by the internationally acclaimed local wine brands. A simple, romantic ambiance, friendly staff and an excellent service will contribute to your unforgettable Vis experience. And in case you need a break from the joys of swimming, sunbathing and enjoying local specialties; Vis offers even more. This island is among the most beloved destinations of navigation experts and sailing lovers. And if you prefer to keep closer to the shore, there is a variety of adventurous sports to enjoy; from paragliding, wind surfing, diving and paddling to cycling, hiking and even cricket. There are numerous organized excursions towards the various destinations in the nearby archipelago of small islands. Try not to miss visiting Bisevo and its famous Modra Spilja (The Blue Cave), a place of magical beauty. The surrounding islands and islets, such as Svetac, Susac, Palagruza or Brusnik are also interesting destinations to visit due to their beautiful beaches, unique nature and the attractive mystery of the deserted island atmosphere. Find information about selected Hotels, apartments and rooms in Vis to choose the perfect place for your accommodation.